Currently, there are four different Shop Fox table saw models available: the newly-introduced W1824 hybrid table saw, the W1819 and W1820 10" cabinet saws, and the W1811 10" sliding table saw. The Shop Fox brand is part of Woodstock International, who has been in business since 1989. They are known for providing good quality woodworking tools and equipment at a great price. Shop Fox sells their equipment through a dealer network; an individual cannot buy directly from Shop Fox. Woodstock International is owned by the same person that owns Grizzly Industrial Tools, and there are a lot of similarities between the companies and their tools. Some of the Shop Fox machines appear to be duplicates of Grizzly models (or vice-versa), just painted a different color. 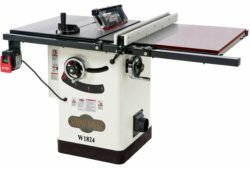 The newest addition to the Shop Fox table saw lineup is the W1824. It has a 2HP motor that can be wired for either 120V or 220V. The Poly-V serpentine belt drive spins the 10" blade at 3850 RPM. Max cut depth is 3-1/8", and the rip capacity is 30". The table, extension wings, and trunnion are made of cast iron, and it also includes a composite extension table. The W1824 comes with an interchangeable riving knife and a quick-release blade guard with anti-kickback pawls. It will accept up to a 13/16" dado blade, and comes with both regular and dado table inserts. It also has a standard 4" dust port. So far, I have only been able to find one review of the Shop Fox W1824, at Amazon , and it is more of a (5-star) review of Shop Fox's customer service than of the saw. The W1824 appears to be almost identical to the Grizzly G0715P though. The general specs are the same, the most obvious difference between the two being the composite extension table. The Grizzly G0715P has eight different reviews on the LumberJocks forum at the moment, and received an average of 4.2 stars. Sidenote: If you are buying your first table saw, or need help tuning up one you already own, I would recommend getting a good book on the subject. The two that seem to be recommended most often on the woodworking forums are Jim Tolpin's Table Saw Magic and Kelly Mehler's The Table Saw Book . Both have great reviews on Amazon, and they cover all the basic operations, as well as safety, maintenance, and accessories. 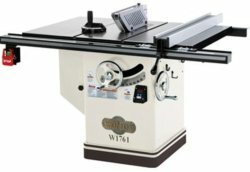 The W1819 and W1820 are 10" cabinet table saws that are very similar to the Grizzly table saw models G0690 and G0691. They have a 3 HP, 220V single phase motor with a triple belt drive. They offer a 3-1/8" maximum cut depth, and have a 13/16" dado capacity. The cast iron table (with wings) measures 27" x 40-1/4". The W1819 has a 13-3/8" phenolic extension (for a total width of 53-5/8"), and the W1820 has a 31-3/4" phenolic extension table with legs (total 72" wide). Rip capacity is 29-1/2" on the W1819 , and 50" on the W1820 . They have cast iron trunnions, a 4" dust port, and a standard 3/4" x 3/8" T-slot miter gauge. Both come with a quick release riving knife and blade guard/splitter assembly and a magnetic switch. A sliding table attachment and router table attachment are available. The few owner reviews I have found for this Shop Fox table saw have all been excellent. A W1819 owner on the Lumberjocks forum said it was "... the best $1200 and change I spent in a long time (NOTE: prices have gone up since then)! The fence was square to the miter slot, no runout on the spindle, and the blade to miter had less than .001 of a difference. I also love the the fence." Amazon.com has a combined total of six reviews of these two saws at the moment, and the average is 4.8 out of 5 stars. Another Lumberjocks review of the Shop Fox W1820 also gave it 5 out of 5 stars. A sliding table saw is great for cutting large panels with precision that is difficult to achieve with a regular fixed-table saw. 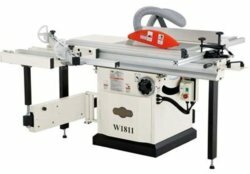 The W1811 comes with a 5HP, 220V, 1-phase motor and a right-tilting blade like many sliding table saws. It has a scoring blade to eliminate cross-grain tearout, and a sliding/swinging crosscut table. The crosscut miter fence has 2 flip stops for accurate repetitive cuts. The Shop Fox sliding table saw has up to a 63" long and 78-1/2" wide crosscut capacity (but not at the same time!) using the crosscut fence, and a 33" rip capacity using the standard rip fence. The W1811 will accept a dado blade up to 13/16", and has a maximum cut depth of 3-1/8". It has an adjustable rip fence, a clamping miter gauge with an extended fence, and an adjustable riving knife. The blade guard has an integral 2-1/2" dust port, and there is a 4" main dust port on the cabinet. I was unable to find any reviews of this particular Shop Fox table saw, but there are a couple of owner reviews of its sister saw, the Grizzly G0623X. On the WoodWorking.org forum, an owner said, "...Overall I'm really happy with the saw and its quality". A professional woodworker on the Festool forum also says he has been really happy with the Grizzly sliding saw. The Shop Fox W1811 appears to be essentially the same piece of equipment. These 12" cabinet saws have been discontinued since this article was originally written. They both offer a quick release riving knife, splitter and blade guard assembly. They have a digital bevel angle readout, a 52" rip capacity, 4" max cut depth, and will accept a 1" dado blade. The W1761 uses a 5 HP, 220V 1-phase motor. The W1762 has a 7.5 HP, 220/440V 3-phase motor and adds an extension table with legs. If you like the looks of the 12" Shop Fox table saws, you may want to take a look at the Grizzly G0696X and G0697X. A Shop Fox table saw provides great value just like a Grizzly, but comes with a 2-year warranty instead of Grizzly's 1-year warranty. 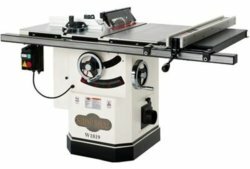 You can get detailed specs on all of the Shop Fox table saw models at WoodstockInt.com. Depending on where you purchase it from, you may be able to save money on shipping and get service after the sale from your Shop Fox table saw distributor, too.